The neighborhood or “colonia” Amapas is located South of Emiliana Zapata and north of Conchas Chinas in Puerto Vallarta, Jalisco, Mexico. It is one of the most desirable areas of Puerto Vallarta in terms of a destination for tourists, due to its proximity to Los Muertos Beach, the Romantic Zone, the restaurants and nightlife of neighboring colonia Emiliana Zapata, all backing up to the hills that eventually grow into the verdant green Sierra Madre mountians. – Los Muertos Beach area, bounded by Calle Gomez on the north and Calle Leo on the south. This runs from the Banderas Bay’s beachfront about 4 blocks inland to Highway 200. It is a mix of hotels, restaurants, condominiums, houses, villas, and shops. Egido lands in the mountains. This area is primarily residential, including single family homes, condominium buildings, villas bed & breakfasts and boutique hotels. Many of these properties are foreign-owned via bank trusts by primarily US and Canadian ex-patriots who live there mostly part time. 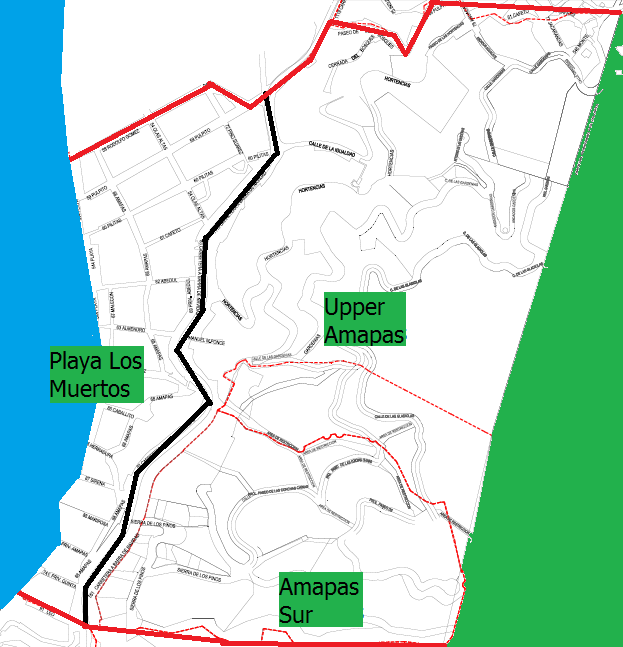 – Amapas Sur which includes the area accessed by Calle Los Pinos east of the highway to the mountains. This more densely developed residential area consists mainly of primarily condominimum buildings.